U.S. District Judge Dana Christensen restored Endangered Species Act protections for Yellowstone-area grizzly bears, and in the process permanently ended planned trophy hunts in Idaho and Wyoming. The state Game and Fish Commission unanimously approved a controversial Wyoming grizzly hunt for the first time since 1975, as 22 bears could be killed under the plan approved today. 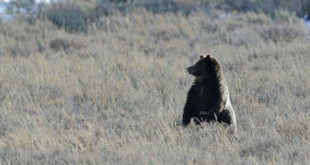 The Idaho Fish and Game Commission approved plans for a hunting season on one male Yellowstone area grizzly bear. Seventy-three scientists have penned a letter to Wyoming Governor Matt Mead calling on him to halt a proposed hunt on Yellowstone area grizzly bears. The Idaho Fish and Game Commission will be hosting meetings next week about its proposed grizzly bear hunting season. The federal judge presiding over the Yellowstone grizzly lawsuits wants the case to be resolved before Wyoming’s anticipated hunting season this fall. This winter, the Blackfeet Nation will become the sixth tribe to join the annual bison hunts outside Yellowstone National Park. A federal judge has ruled the federal government must review whether Yellowstone bison warrant protection under the Endangered Species Act. According to a new study, grizzlies in the Northern Continental Divide Ecosystem may someday bridge the gap separating them from Yellowstone grizzly bears.